Maximum Flow Rate: 19,300 Litres/Hour. Maximum Head: 4.6 metres. Power Consumption: 30 watts (min) - 260 watts (max). Dimensions: L490mm x W240mm x H210mm. Cable Length: 8 metres (12v) + 2 metres (230v from Transformer to mains connection). Oase Germany have developed the all-new low voltage AquaMax Expert Eco 20000 12v pump for more demanding applications in swimming ponds and pools which cannot contain 230 volt electrical components due to human access in the swim zones. The potent pump delivers up to 18,600 litres per hour (310L/Min) and has a vertical lift capability up to 4.3 metres, yet consumes a meagre 260 watts at full flow. 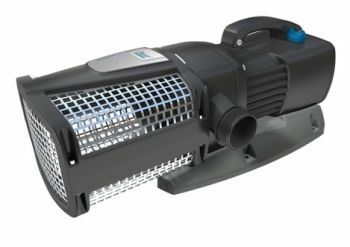 The AquaMax 12v Expert Eco 20000 solids-handling pump is perfect for delivering debris and detritus to a filter system such as the new ProfiClear Premium Compact-L pump fed filter to automatically extract pond sediment and/or connection to the Bitron Eco series of Ultraviolet Clarifiers to minimise single celled algae (green water) growth. The heart of any filter system is the pump and cutting-edge, German engineered technology now makes this possible in large swim ponds. The Aquamax Expert Eco 12V 20000 features Oase's Season low Control (SFC) function to reduce flow during the cooler months and therefore reduce power consumption. Furthermore, the 12V pump can also be connected to the FM Master WLAN EGC Controller and EGC Connection Cables to facilitate the control of water flow, on/off and timer controls, all via an App on your smart phone or tablet. OASE AquaMax Eco Expert Pumps - Technical Information. 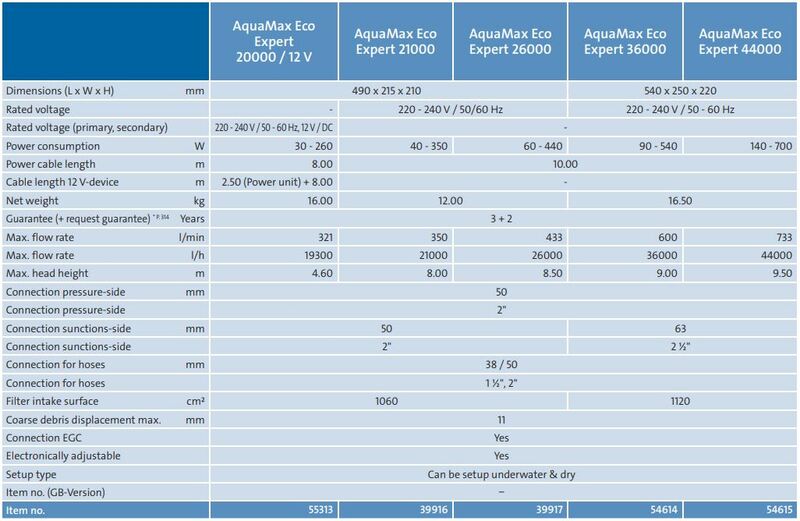 OASE AquaMax Eco Expert Pumps - Performance Curve Chart.